Sport and Wellbeing offer a range of different membership options to suit levels of engagement. The table below is designed to guide what membership would allow you to access the facilities you wish to use. This membership gives you access to all gyms, classes and casually bookable activities at any of our locations with no time restriction*. You will have priority booking for courts and classes, and will receive a discount on any courses booked**. This membership also gives access to AU/IM sport. 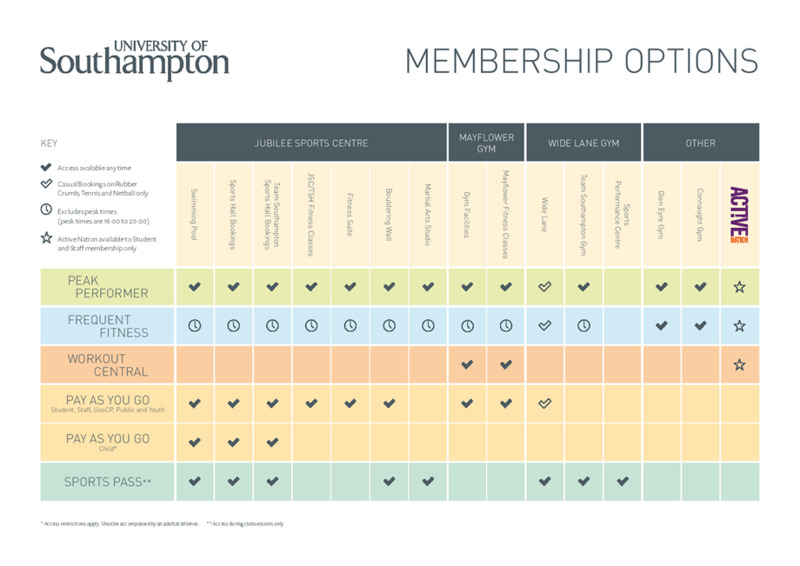 Access to the Active Nation facilities is included for Students and Staff of the University of Southampton. This is an off-peak membership giving you access to all gyms, classes and casually bookable activities at any of our locations except 16:00-20:00 Monday-Friday. Classes and Courts can still be booked, and the Mayflower and Jubilee Sports Centre gyms can still be used, between the hours of 16:00 and 20:00, but at an additional charge. The Connaught and Glen Eyre gyms can be used between 07:00 and 22:00 with no restrictions. You will have priority booking for courts and classes, and will receive a discount on any courses booked**. This membership also gives access to AU/IM sport. This membership gives you access to the Mayflower gym and classes in the Mayflower Studio only, with no peak time restriction. You will have priority booking for classes in the Mayflower Studio. No course discount is available with this membership. This membership is for customers who wish to only participate in Athletic Union clubs or the Intra Mural leagues. It does not include access to any classes , any of the gyms (except for the TSG during Focus Sport sessions). Access is for AU training/matches and IM matches only. Sports Pass members wishing to book courts to train in addition to their slots allocated by the AU, or who wish to attend classes, can do so on a Pay As You Go basis (booking is restricted to 2 days in advance). This membership is for 4-15 year olds. This can only be purchased when an adult is buying a Peak Performer or Frequent Fitness membership. If the adult cancels their membership then the Child membership will automatically be cancelled as well. Click on the link below for more specific information about facilities that can be accessed by the child. Access to the Pool and Courts will be under the same time restrictions as the membership the adult has. *The Swimming Pool, Team Southampton Gym and Sports Halls are subject to timetables.